I suffered serious injuries in a car accident, and it was taking so long to get any answers, I knew that I would need help. I was looking for a law firm that would care about us - someone that would go out of their way to help us. 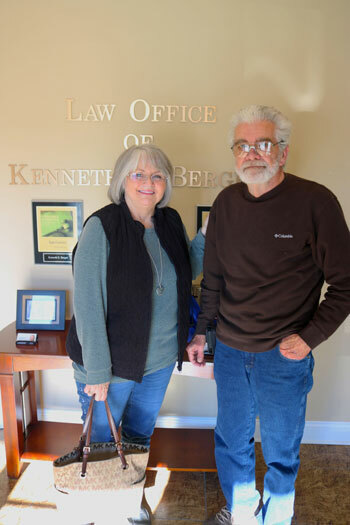 After I hired the Law Office of Kenneth Berger, I was surprised by the family feel and friendliness of the staff. I always enjoyed seeing everyone, even the dog, Rex. The whole time we worked with them, we never felt like we were put on the back burner. We were treated wonderfully. It was never, "I'll call you in a week or two." I had my attorney's cell phone number, and the team always updated us. The firm made us feel loved and at ease, and they gave us confidence. If I couldn't get something done, I could always count on them. Now that the case has come to an end, I know there's still a lot I'll have to go through, but it feels good - I'm going to miss everyone though.